It took us about 25 minutes to get from Ohrid to the Macedonia-Albania border. As we pulled up on the Macedonian side, semi-trailers and big trucks lined either side of the road, with a few cars thrown in for good measure, some of them pointing in the wrong direction on the one way road. Men wandered back and forth, smoking and talking to each other, crossing in front of our car, waiting for something I’m sure. There was just enough room for one vehicle to squeeze through. There were only three cars ahead of us, and by the time we got through both checkpoints only 20 minutes had passed. 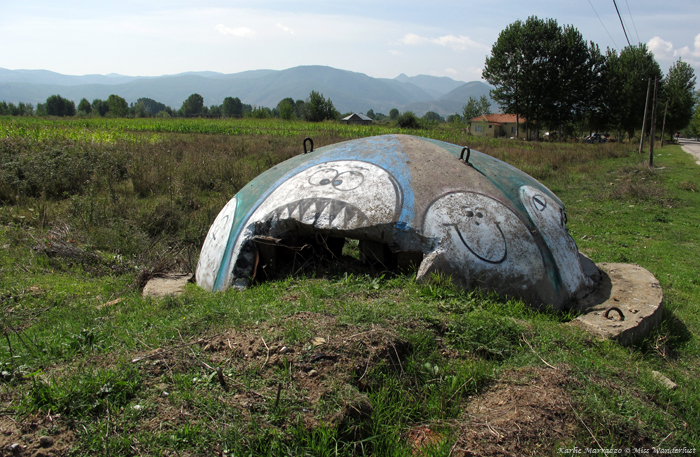 Maybe it was a trick of the mind, but the world seemed different as soon as we crossed into Albania. The land and the sky seemed to burst wide open and stretch on endlessly before me. The hills rolled more gently. There were goats meandering along the side of the road, and an old man was slowly walking across the open meadow with his flock of sheep and his dog. We pulled over for a few snaps in front of the Albania sign to commemorate the moment – Albania was the 30th country Dave visited! 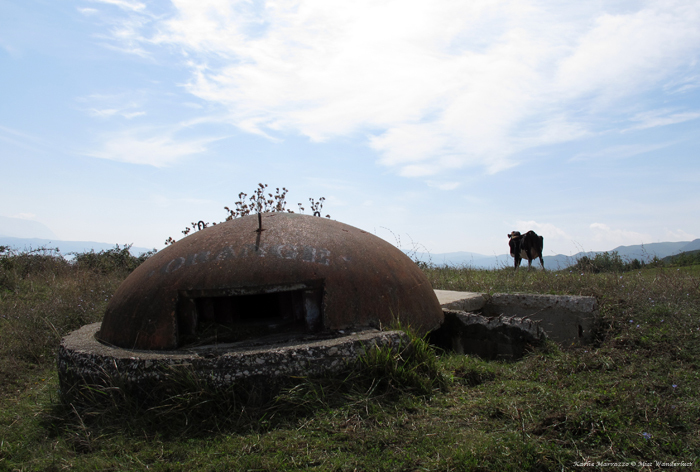 During his tyrannical rule that lasted over four decades, notorious and paranoid Communist leader Enver Hoxha had over 700,000 concrete bunkers constructed throughout the country. This equals an average of 24 bunkers per square kilometer, and one for every four inhabitants. We were eager to see them and didn’t have to wait long – about 5 minutes after we crossed the border we saw a few dotting the land along the highway. For the second time in minutes we pulled over, this time in front of a gas station-slash-café with tables outside. We crossed the highway to take a few pictures and picked up a straggler, a stray dog who seemed invisibly tethered to my ankles, despite the best efforts of the guys sitting at the café tables trying to shoo him away. 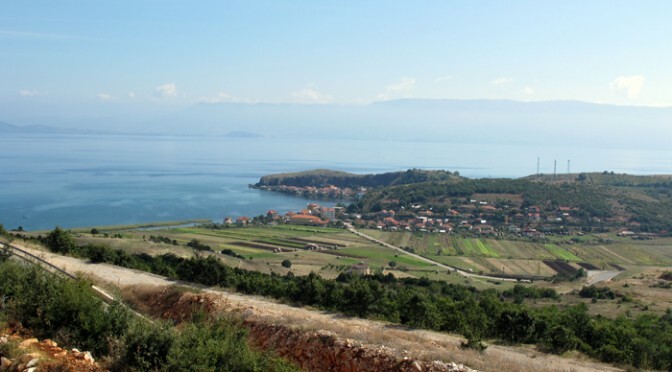 The gorgeous scenery continued to unfold before us, the undulating green land, the vast hazy blue expanse of Lake Ohrid, and the terracotta roofs of the tiny village of Lin tucked along the shore. We pulled into town. There were children doing exercises with their teacher along the road. A few people were walking about, down the middle of the narrow cobblestone road. We had to drive very slowly and carefully, calling even more attention to ourselves, the obvious outsiders. We kept getting that look, that mixture of curiosity and a questioning glance, both of us looking at each other like zoo animals, wondering where the other one came from and what they’re doing and what their lives are all about. Perhaps we would have had a different experience had we parked and walked through the little village. Once the road became too narrow, we got out of the car and soaked up the incredible silence. Complete peace. 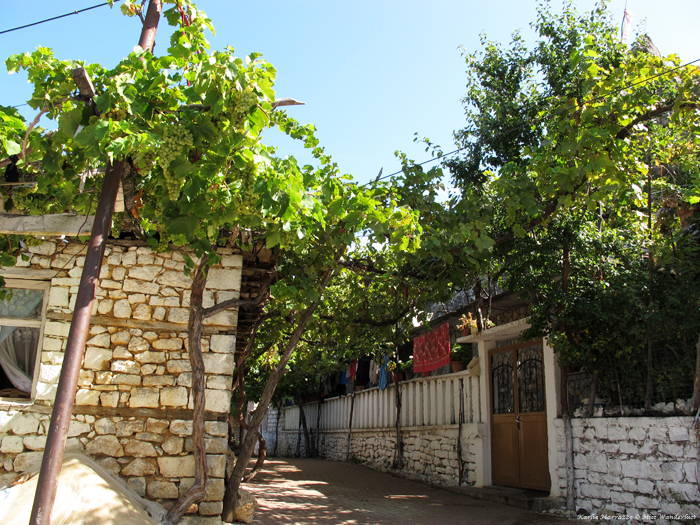 We parked beside a beautiful garden with grapevines crawling everywhere, along the walls and over our heads on a wooden lattice. 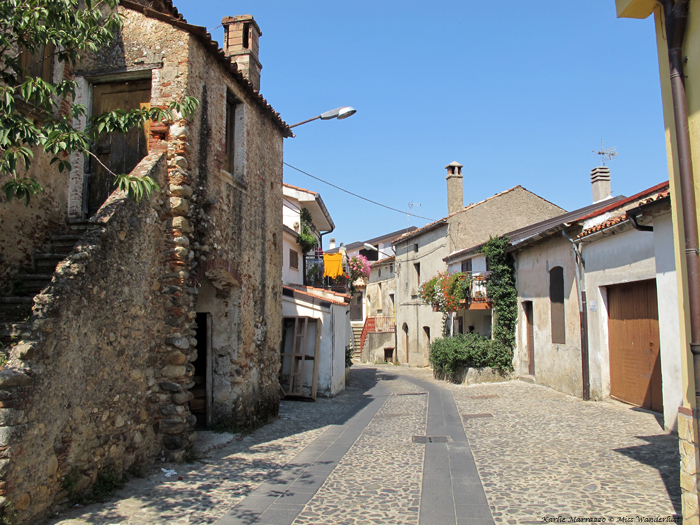 Lin looked eerily similar to Donnici Superiore, the village in Southern Italy where my Nonna is from. I wished I had known about this place sooner and were spending my time in a quiet B&B, enjoying the solitude and the sound of the waves lapping the shore. 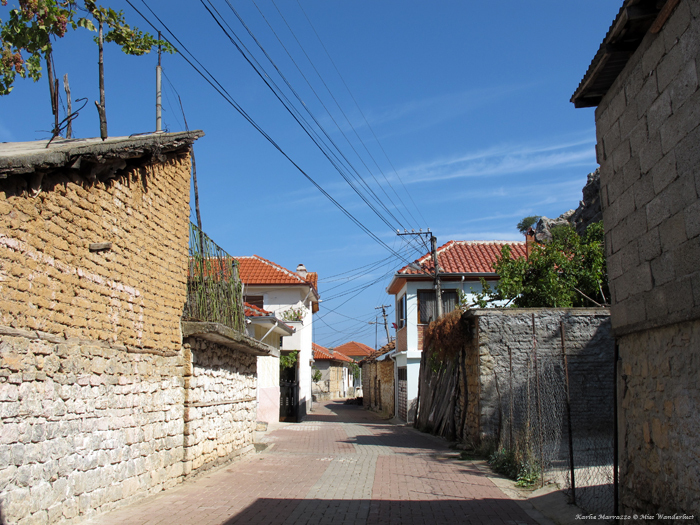 We didn’t research much info about Albania before our day trip since we didn’t know if we would make it there or not, so it wasn’t until later on that we found out about a partial archaeological excavation that is on the UNESCO tentative list. As we drove on with no real plan we stopped whenever something caught our eye. The road ran alongside the lake the whole way and was in fairly good condition, although there was construction in some parts. The road was lined with many hotels and restaurants that look like they were constructed in the 70s and haven’t seen a customer since – more of these establishments than would seem necessary for the area. We also saw a lot of similar, ugly cement hotel blocks in Montenegro and along the Dalmatian coast in Croatia, packed with tourists from Poland and Russia. Countless intimidating-looking Mercedes sedans passed us. At one point we passed one of said cement looking hotels with many said Mercedes sedans parked around it, surrounded by police cars, well-dressed Albanian men in suits standing scattered about at barely 11 o’clock in the morning. Pope Francis just so happened to be in Albania that day, giving an open air mass in the capital city Tirana. 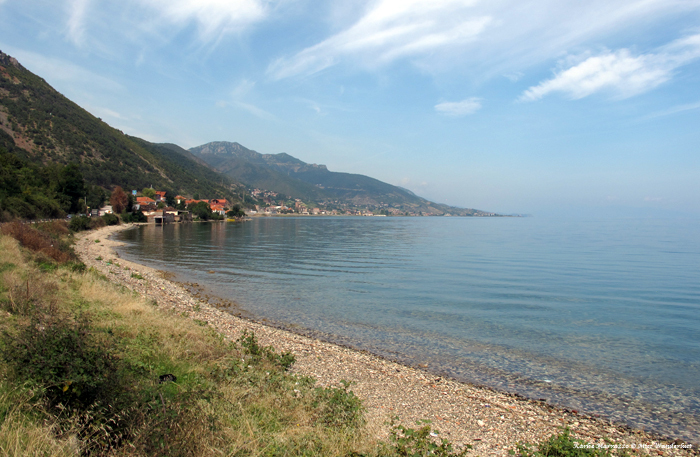 The next stop on our road trip was Pogradec, a small city of 20,000 people sitting on the southern shores of Lake Ohrid. 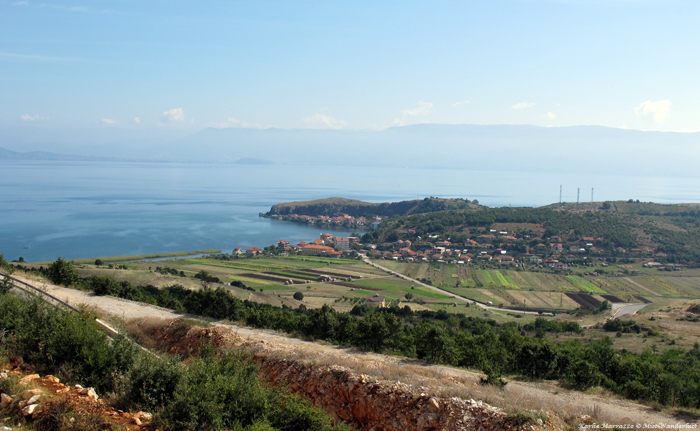 Again, I wasn’t expecting much because I hadn’t read much, but Pogradec turned out to be a totally regular place. So regular, in fact, that it now has the distinction of being the only place I have ever been to where I wasn’t able to find a postcard to mail myself! We found a tiny hole in the wall restaurant serving up our favourite Balkan treat, burek. Not having any Albanian lek on us, we were able to pay in Euros and receive lek as change, a very cool souvenir. The wide waterfront promenade was a very nice place to take a relaxing stroll before we got back in the car and hit the road again. As we drove out, we passed by more and more deserted hotels with empty beach chairs shaded by beach umbrellas. 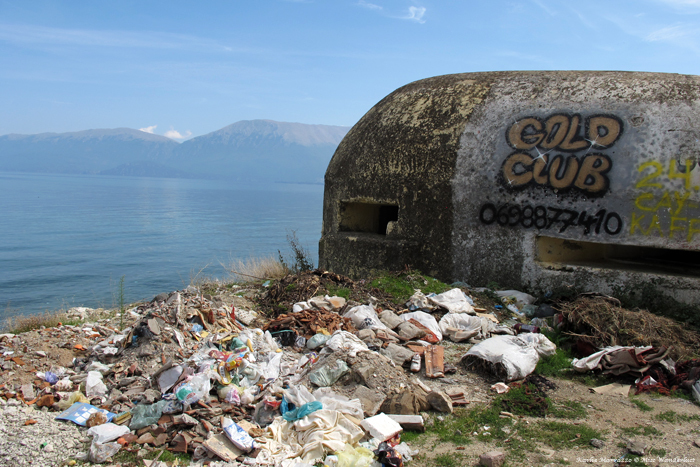 One of our last stops in Albania was a huge bunker along the water, big enough for several people to fit inside, with GOLD CLUB cheekily spray-painted on the side. Inside was anything but, the floor carpeted with garbage and the strong stench of human waste baking in the sun. We passed through the borders again and made one more stop before getting back to Ohrid; St. Naum, one of the most popular tourist attractions in the region, famous for it’s monastery and a destination for many day trip boat rides from Ohrid. While it was a beautiful spot, Dave and I were disappointed with the experience. It was a big, busy pay parking lot, a wide sidewalk lined with souvenir stands the whole way, and a hotel. The monastery was hidden away inside the courtyard of the hotel and it took us a few minutes to even find it. The best part of the grounds was the peacocks roaming about. 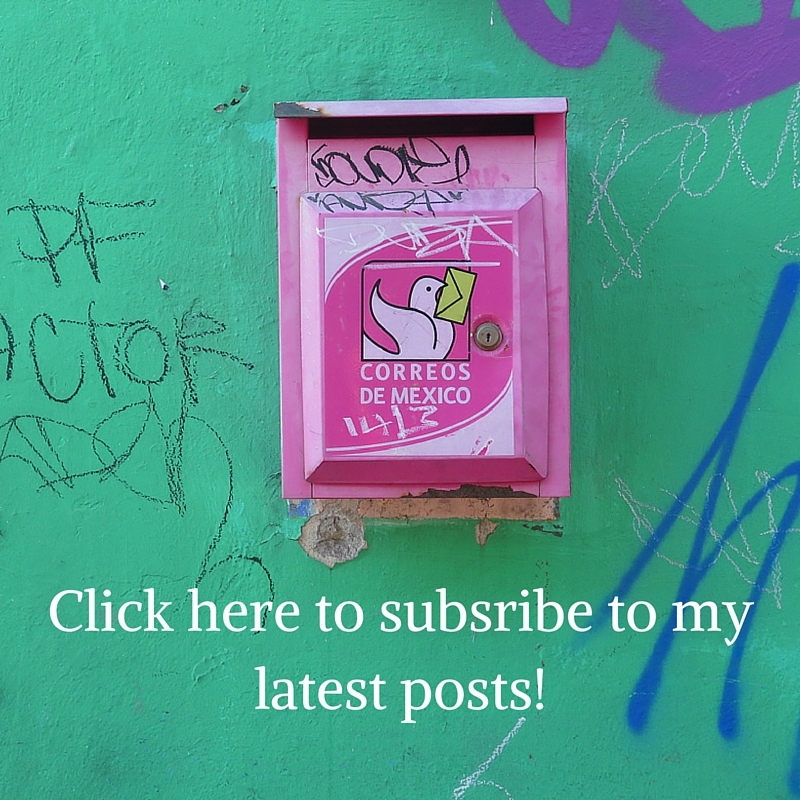 To read about the rest of our time in Macedonia, click here. I really want to go to Macedonia. It’s so nice to hear you really enjoyed your road trip.